There's another Portal that opened in 1994, the band formed by 3/4 of Cynic shortly after the release of Focus. That Portal closed shortly after releasing a demo. This Portal is still wide open after its own 1994 birthing, and like the infamous refrigerator from Ghostbusters, it's let some pretty awful things pass between this world and whatever hellish nether-region it connects to. The awfullest are on the Australian band's third full-length album Swarth. Of course this is death metal, so the awfuller the better. But even in a genre in which the words "beastly," "inhuman" and "brutal" are used to express approval, Portal manage to out-nasty pretty much every other band on the planet. WTF, mate? They do it by holding up a cracked, dusted-over mirror to death metal. Portal's guitars seem to detune themselves as they're played, turning tremolo picking into the revving of broken vacuums. Drums clatter in brief surges, rumbling where they should crash and pummel. Nothing locks; gusts of hoarse bellows from vocalist The Curator howl through like a tornado ravaging a ghost town. The uniqueness of Portal's sound obscures some pretty out there song structures, too. 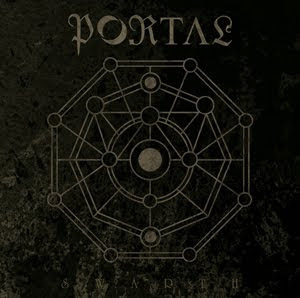 Like Gorguts, whose Obscura is perhaps Swarth's closest spiritual cousin, Portal's abstraction lies in its disorienting vibe. But don't call their willfully esoteric sound and lyrics pretentious. This is primal music, and it disturbs at a deep, physical level. Portal's commitment to unease is total. What could be more metal than that? I've given this record so many opportunities and I almost desperately want to like it, but it just ain't happening. I hear you on the detuned guitars thing, which was my first impression as well.